Asian Hiking Team staff and travelers are a very avid lot; unafraid to speak up about moral and public impartiality issues they may be confronted with during their travels. Human rights issues, poverty, environmental concern and are many, but one of the areas that Asian Hiking Team folk are most verbal about is animal welfare. As a responsible travel focused business, operating around the globe, we’ve set policies around not participating in activities that cause animals wild or domesticated. 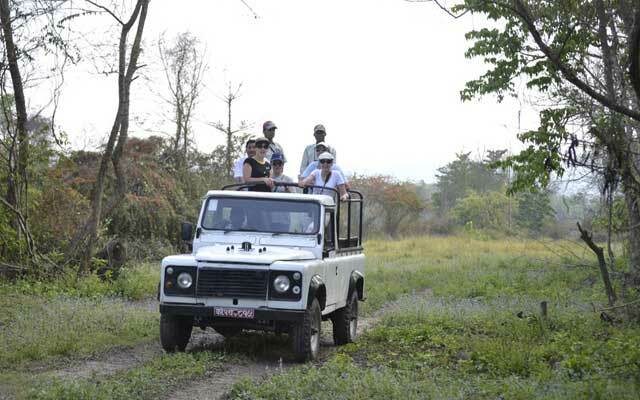 Jeep Drive one of the active and exciting activity for Jungle safari. Jeep Drive goes through the grasslands, river line forests and sal forests to Kasara (the National Park's head quarters) Gharial Hatchery Farm where you will learn about how crocodiles are brought up at this farm & then later released into the rivers. It is totally disturb wild animal. We’ve put a big stress on education and communicating our basis. Asian Hiking Team travelers very much welcome being better informed and knowing that their travel choice is not causing harm to these strange wild animals. We hope that the increased support to commendable venues will help cheer others to lift their standards. Asian Hiking Team has always felt this is just wrong, and don’t include visitation to these type of Chitwan parks on Asian Hiking Team trips.